What types of homes does Whelan Master Builders build? Whelan Master Builders are custom home builders. We build new homes and renovate and extend existing homes. We also build commercial projects. We are always looking to improve our services to you. Your feedback is welcomed. Does Whelan Master Builders have design / architectural services? Whelan Master Builders work with a number of skilled and respected architectural firms and designers. We are happy to arrange a consultation for you. In what suburbs does Whelan Master Builders operate in? 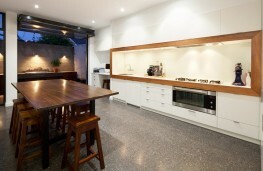 Whelan Master Builders is a Melbourne-based builder servicing all of Melbourne. We have completed projects in Williamstown, Yarraville, Fitzroy, Essendon, Princes Hill, Hawthorn, St Kilda, Prahran, Malvern, Elwood and Brighton. Whelan Master Builders is Green Living Accredited. What will this builder do to reduce the environmental impact of our build?